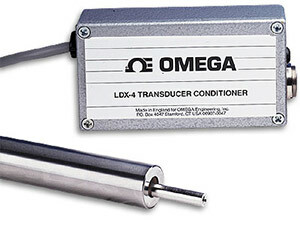 The LDX-4 is a dc powered signal conditioning amplifier and power supply for ac LVDT's. Its compact, rugged case can withstand industrial installations and protect laboratory grade electronics. Complete zero and span adjustments allow the LDX-4 to be used with any LVDT with an output between 45 and 450 mV/V full scale. Selectable outputs of ±5 V or ±10 V interface with recorders, displays, and other instruments. Also, when using the ±5 V output range, a second 0 - 20 mA signal is available for retransmitting the signal over long distances.